It’s kind of surprising that in this day and age, people are still trying to get books removed from school libraries and the general circulation. Given the depraved and shocking things available to any child with a netbook and a web browser, you’d think there’d be greater concern placed on parent supervision rather than community action against offensive materials. You’d be wrong, as people are still writing angry letters to libraries trying to get books restricted. 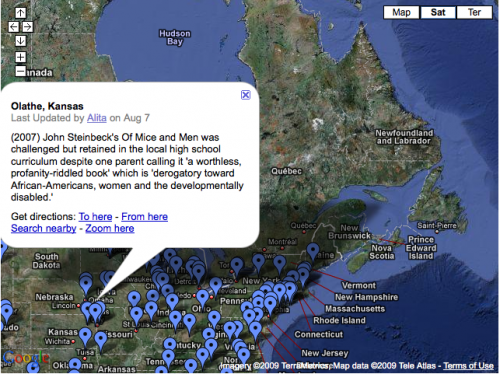 To create awareness of Banned Book Week, the ALA has created an interactive map of book bans and challenges over the past two years, with pop-ups detailing in depth the book challenged and why. Now, I’m completely against censorship, but at the same time I understand that there might be a need to create age-appropriate sections of the library. There’s a reason the kid books are separate from the adult and teen literature, after all; however, I don’t believe it’s the library’s job to decide what is or isn’t appropriate for my kid to read, and it is definitely not the job of some community activist with a burr in his or her bonnet. The books should be on the shelves, and the parents should do some parenting. That’s all there is to it.